Hannah Whitish scored 25 of her career-high 29 points in the second half and Nebraska played suffocating defense to flip Kansas 30 points on the scoreboard, as the Husker women’s basketball team rolled to a 66-49 win at historic Allen Fieldhouse on Wednesday night. The victory was Nebraska’s first true road win since defeating Michigan in Ann Arbor on Jan. 24, 2016, as the Huskers improved to 6-3 overall while handing the Jayhawks their first loss of the season, snapping KU’s seven-game home winning streak. 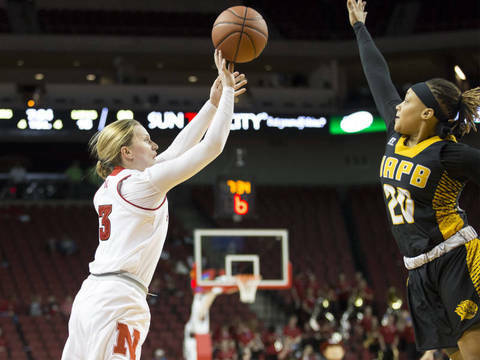 Whitish, who opened the game 0-for-6 from the field, hit all six of her second-half shot attempts and a three-pointer near the end of the first half to help the Huskers rally from a 13-point second-quarter deficit. For the game, Whitish hit 7-of-13 from the field including 4-of-9 from beyond the arc after starting 0-for-5 from beyond the arc. Whitish also hit 11-of-14 from the charity stripe, and added four assists, five rebounds and three steals on the night. Whitish made eight consecutive free throws in the closing minutes to help the Huskers win going away. While Whitish carried the offense, Nebraska’s team defense was at its best in the fourth quarter, holding the homestanding Jayhawks to just four points – all free throws – forcing KU to go 0-for-14 from the floor in the final period. Nebraska held KU to just 13 points in the second half tying for the fourth-fewest points by an opponent in the second half in school history. Nebraska led 12-7 early on the strength of terrific defense until freshman center Kate Cain picked up her second foul with less than one minute left in the opening quarter. The Big Red led 12-10 at the end of the first, but Cain did not play in the second quarter and Kansas took advantage without Cain at the rim. The Jayhawks surged to their biggest lead at 33-20 after a three-pointer by Austin Richardson with 2:35 left in first half. Whitish, who was held scoreless for the first 17:41 in the game, hit a free throw with 2:19 left. Kansas native Emily Wood then hit a three for the Big Red with 1:16 remaining, before Whitish knocked down her first field goal with her own three-pointer with 24 seconds left to trim KU’s margin to 34-27. Christalah Lyons, who led KU with 12 points on the night, hit a pair of free throws with five seconds left, to send the Jayhawks to the locker room with a 36-27 lead. But Whitish carried the confidence from her made three at the end of the half into the start of the third quarter, burying another three just 15 seconds into the half to pull Nebraska within 36-30. Five straight points from Whitish, including a three with 1:46 left in the quarter gave Nebraska its first lead of the half at 43-41, but KU responded with four straight points to regain the lead. Cain tied the score with her basket with 41 seconds left, before Bria Stallworth hit a free throw with 3.4 seconds left to send the Big Red to the fourth quarter with a 46-45 lead. Lyons hit a free throw to tie the score at 46 with 8:55 left, but Whitish dominated the last nine minutes of the game. She hit another three and added a jumper to give Nebraska a 51-46 lead, before Nicea Eliely got a layup with five minutes left to give the Huskers a 53-46 edge. Another two by Whitish and a three-pointer by Wood with 3:05 left gave Nebraska a 58-46 advantage, before Kylee Kopatich ended a 7:14 scoreless drought for KU with one free throw. Kopatich finished with 10 points, but went just 3-of-12 from the field. Whitish then sealed the win with eight free throws in the final 1:31, and a Nebraska defense sparked by tenacious ball-hawking by Jasmine Cincore and the shot-blocking of Cain shut out the Jayhawks from the field. Whitish was the only Husker to produce double figures, but she was far from the Nebraska’s lone contributor. Eliely added seven points, three assists and a steal, while Wood pitched in six points, two rebounds and an assist off the bench. Maddie Simon added six points, seven rebounds and two huge steals, while Cain contributed five points, a game-high nine rebounds and a game-high five blocked shots. Cincore added five points, four assists, two steals and a block while being a disruptive force on the defensive end, especially in the fourth quarter. In all, nine Huskers found the scoring column while 10 Huskers had at least one rebound. As a team, Nebraska hit 37 percent (20-54) from the field, including 32 percent (8-25), and 18-of-28 free throws (.643). The Big Red held KU to just 28.6 percent (16-56) from the field, including just 4-of-19 three pointers. The Jayhawks were 0-for-9 from long range in the second half. Kansas also hit 13-of-23 free throws (.565). Nebraska won the turnover battle, 16-9, and outscored the Jayhawks 18-5 in points off turnovers. The Big Red lost the rebounding battle, 42-40, but outscored KU, 8-5 in second-chance points. In a defense-heavy first half, the Huskers shot just 27.3 percent on 9-of-33 shooting from the field while Kansas shot 12-of-25 (48 percent), including 8-for-11 (.727) in the second quarter alone. The Jayhawks were also 3-of-5 in the quarter from long range. In the second half, Nebraska outscored Kansas, 39-13. The Huskers continue road action on Saturday when they travel to Drake. Tip-off with the defending Missouri Valley Conference champion Bulldogs at the Knapp Center in Des Moines is set for 2 p.m.